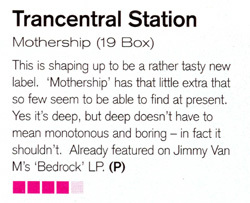 Known for the hit number "Tears", Trancentral Staion has put the 3rd single "Mothership". As it is primarily released in Japan prior to "Tears", this is a long-waited world release! Originally it was created for MIX CD "Take Off-Mothership DJ Mix Vol.1". Since it has been very popular in Japan, and it was recognized as the first original tune of Japanese progressive house music, it was to be re-released with the new remix. "Mothership" was formerly the name of the biggest party in Tokyo where Japan's number one DJ - DJ 19 made his huge name. This record is by far the biggest thing to come out on the label so far. Trancentral Staion was formed as the project of DJ 19 & Hiro Kuretani. Trancentral has a hybrid significance of penetrating [Trans] and going beyond [Trance] combined with the core [Central]. Of course, it stands for their wish of that their music will be perceived as located in the center of music scene. Steve Porter who is an America's New Hope turns in his best work yet with a groovy percussive workout that just doesn't let up. A breakdown gives you just enough time to take a breath before the journey continues. Already a big tune for DJ''s worldwide. The Steve Porter remix has already been featured on Jimmy Van M's recent "Bedrock" album, Andy Jarrod's "Extrema" album for Holland and DJ 19's "ESSENCE PHASE ONE〜deep & funky concentration〜".